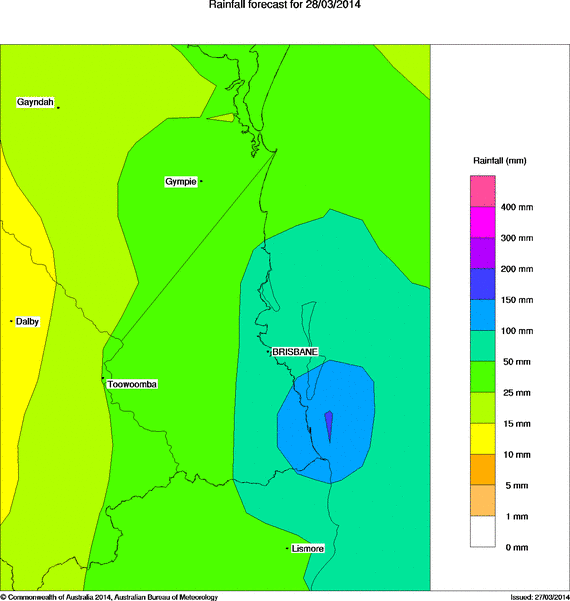 There's STILL more rain coming with 100-150mm rain forecast for the Gold Coast region on Friday. Add this to the 50-100mm we've already received there's a real risk of flash flooding and even minor flooding in rivers and catchments. Plus if that's not enough, in the wake of the clearing rain, there's the chance of afternoon thunderstorms. At 9pm EST, a deepening surface trough extended across the southeastern interior of Queensland. The trough is expected to slowly drift towards the southeast during Friday and move off the northern New South Wales coast by early Saturday. An associated cloud band currently extends across southeast Queensland, which should gradually contract offshore during Friday morning. The areas of heavy rain are expected to contract towards the southeast overnight before moving offshore during Friday morning. The 9:49pm Severe Weather Warning for heavy rainfall in the Southeast Coast, Wide Bay and Burnett, and parts of the Darling Downs and Granite Belt districts is still in effect. Areas of heavy rain, which may lead to flash flooding, are currently occurring in these districts. 24 hour totals of 50 to 150mm are likely, with some isolated heavier falls expected. There's also a Flood Warning for Coastal Rivers (South) as river level rises above the minor flood level are possible in the areas of heaviest rainfall. The wet weather is also causing issues on local roads, including the Tugun Bypass northbound with a single lane closure due to water over the road since around 3pm Thursday. Other reports of water over the road including Lawrence Drive Nerang. Plus at around 7:30pm, Energex reported there were over 5000 properties without power in the southern Gold Coast including Tugun, Bilinga and Coolangatta. As of 10pm, this figure is still around 2000 properties in Coolangatta and Bilinga. So stay safe, stay alert Gold Coast! If you need assistance with flood or storm emergencies, contact the Queensland SES on 132500. All other life threatening emergencies please call 000.